Sky map showing the location of Comet C/2017 O1 ASAS-SN on the night of Oct. 6, 2017, as seen from New York City. A newfound comet is putting on a show in the night sky now, and you should be able to see it with a pair of binoculars. The comet C/2017 O1 ASAS-SN might be one of the brighter ones that has come our way over the past several years, and it's currently favorably placed for Northern Hemisphere observers in the late-night sky. The comet was first seen on July 19 by the All Sky Automated Survey for Supernovae (ASAS-SN) system at the Cerro Tololo Inter-American Observatory in Chile, which explains its unusual moniker. The survey's main task is to keep watch for exploding stars, but in the course of its regular imaging of the night sky, it occasionally runs across other objects. This is the first time that the ASAS-SN has discovered a comet. C/2017 O1 ASAS-SN is currently moving on a northward path. After the comet was found in the constellation Cetus (The Whale), it passed just to the west of the stars of Eridanus (The River) in early August and then up into Taurus (The Bull) by late August. Around Sept. 20, it passed almost midway between the two famous open star clusters in Taurus — the V-shaped Hyades and the Pleiades, popularly known as the "Seven Sisters." Currently, Comet C/2017 O1 ASAS-SN can be found between the constellations Auriga (The Charioteer) and Perseus (The Hero). On Oct. 17, the icy wanderer will move into the boundaries of the faint constellation Camelopardalis (The Giraffe). This region of the sky is low above the northeast horizon at around 8:30 p.m. local daylight time, but it gets higher as the night wears on. By around 3:30 a.m., it is almost directly overhead. Gareth Williams of the Smithsonian Astrophysical Observatory has calculated an orbit for C/2017 O1 ASAS-SN, based on 1,154 observations of the object from July 19 to Sept. 15. This work indicates that the comet will pass through the perihelion point of its orbit — its closest approach to the sun — on Oct. 14, at a distance of 139.3 million miles (224.2 million kilometers), placing it just inside the orbit of Mars. But predictions about C/2017 O1 ASAS-SN's visibility are difficult, because the comet's overall brightness has proved to be rather erratic. This isn't unexpected; comets are notoriously unpredictable, and this is especially true with a newfound comet such as this. Shortly after it was discovered in July, C/2017 O1 ASAS-SN inexplicably underwent a sudden brightness surge, ramping up from magnitude 15 to magnitude 10 — a factor of 100 — within just a few days. Currently, the comet appears to have settled at around eighth magnitude, and some assiduous comet watchers have indicated that its brightness appears to be slowing as it approaches the sun. You also will need a sky chart or atlas showing the comet's position among the stars. If you're sweeping the sky with binoculars or using a small telescope, be advised that what you are looking for is not a sharp, bright object like a star, but rather a fuzzy, circular blob of light somewhat resembling a globular cluster. Unlike an eighth-magnitude star, which shines as a distinct point of light, C/2017 O1 ASAS-SN's glow is spread out as a less obvious blur. If you look carefully enough, you might even detect a faint hint of green. This verdant tint is from diatomic carbon; it has shown up very well on recent images taken of comet C/2017 O1 ASAS-SN and may even be visible to sharp-eyed observers. The comet has also displayed a relatively short tail of gas, which is difficult to discern firsthand but is far more obvious in photographs. Perhaps your best opportunity to make a sighting is to use a naked-eye star that can be pressed into service as a benchmark to find the comet. 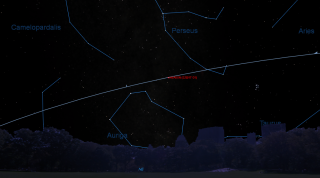 A good opportunity will come on the evening of Oct. 28, when the comet will pass less than a half-degree (the apparent width of the moon) from the fourth-magnitude star Alpha Camelopardalis. You may want to wait until after the moon — which will be just past first-quarter phase — sets later that night, at around 1 a.m., to try seeing the comet against a dark sky. Editor's note: If you have an amazing night-sky photo you'd like to share with us and our news partners for a possible story or image gallery, send images and comments in to spacephotos@space.com. Joe Rao serves as an instructor and guest lecturer at New York's Hayden Planetarium. He writes about astronomy for Natural History magazine, the Farmer's Almanac and other publications, and he is also an on-camera meteorologist for Fios1 News in Rye Brook, New York. Follow us @Spacedotcom, Facebook or Google+. Originally published on Space.com.